The Nesco Xagave is a wonderful sweetener that will help you achieve your health goals, weight loss, improved digestion more energy or enhanced immune system. It is a unique and special blend of the nectars derived from Agave Tequiliana (Blue Agave) and Agave Salmiana (White Agave) plants. It is a very low glycemic index food (approximately 30 to 35), does not raise your blood sugar levels and the inulin (a soluble fiber), helps to further moderate it. It is organically grown. 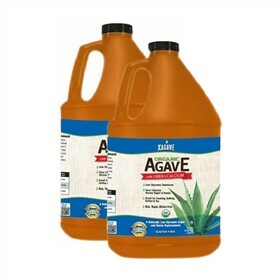 The Raw Organic Agave (2-Pack) has many exciting features for users of all types. The Raw Organic Agave (2-Pack) is sold as a Brand New Unopened Item.